Positive Temperature Coefficient(PTC) heating elements are small ceramic stones with self-limiting temperature characteristics.PTC stones have fast heating response times and plateau once the presefined reference temperatures is reached.It gives even heat distribution and quick temperature recovery time. The built-in ionic generator emits negative ions-negative charged atoms and molecules that can interact with the molecular particles in your hair.They seal the hair cuticle reducing frizziness, splits ends,knotting and increasing hair manageability,leaving hair silky and lustrous! The default operating temperature is 190?,you can short press the temperature button to adjust the operation temperature.Once the temperature is set,then temperature LED setting light will start flashing.It will stop flashing and stay on when the set temperature is reached. Level1,around 150?,suitable for first time user or user with thin and fine hair,or bleaches hair. Level2,around 170?,suitable for dyed or dark color hair. Level3&Level4,around 190? to 210?,suitable for normal or slightly curled hair. Level5:around 230?,suitable for thick and very curly hair,or difficult to style hair. Automatic Security Turing off after a usage of 45 minutes. Travel International use:need an extra international power plug adapter. Built-in Ionizer: Anion density up to 6000000 pcs/cm³. Negative ions can neutralize the positive charge to reduce the static frizz static electricity, bifurcation and tie. Reproduce smooth shine charming hair! Super Rapid Heating: Instant heating in less than one minute allows you to simply plug in and begin brushing. 5-Speed Thermostat Design: Set to desired temperature using the built in LED screen and begin brushing. Temperature settings range from 150?for straighter, finer hair to 230? for thick and curly hair. Patent Anti Scald Teeth Design: Merge the ceramic iron straightener, detangling brush, anion hair massager together, gives you a comfortable and safe experience during straighten your hair. 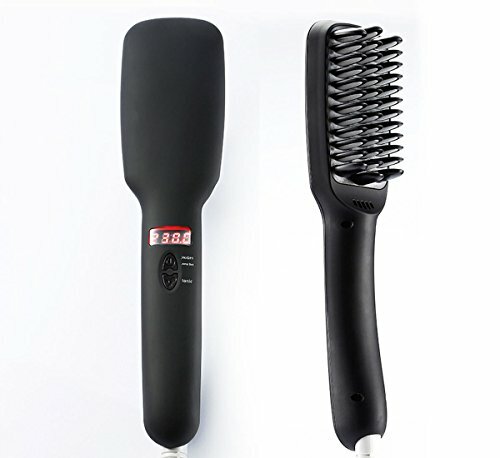 Improved parallel bristles design makes our straightener brush work well with thick & long curly hair. Comfortable to Use: The handle adopt ergonomics design, more fashion and more comfortable. 360°rotatable tail keep the line shapely, make brushing more convenient.